Thank you for your patience on updating this blog. Like many other Americans, there are many times where I juggle more responsibilities than I seemingly have time to juggle such commitments. One such commitment was a 6 week long summer course. My 4.0 GPA did not remain intact, but I managed to work full time and make progress on my graduate degree. Only 12 credits left to go!!! Once again, I owe a great deal of my success to my in-laws. My mother-in-law watched my daughter every day after her preschool ended for the academic year. As well, my in-laws took my daughter on their vacation out of state. This blessing freed me up to focus more on my studies. As well, our daughter gains the benefit of connecting with our extended family. She truly enjoyed the time with her grandparents and one of her aunts, cousins, and great grandmother. Today I wanted to talk about an issue I was hesitant to discuss on July 4th: fireworks. 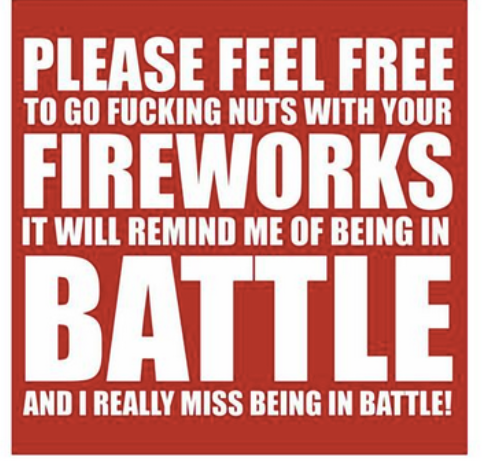 While there is no such thing as a typical veteran and his or her response to fireworks, my feelings about July 4th encompass a greater stress. My friend, Bart Carroll, and one-time high school boyfriend, was murdered on this day back in 2002. I gathered that day with many who knew him to watch fireworks. To me, it was a way to honor his memory. For many years, I’ve enjoyed watching fireworks to continue this tradition, but I’ve enjoyed this privilege with some set off distance from most fireworks displays. I lived in places where individuals could not shoot off fireworks in their neighborhood or it was not popular in the community to do so. As well, when we lived in Cody, Wyoming, our back alley provided an unimpeded view of the city’s fireworks display so I never watched fireworks close up there. My husband found this image on Facebook on the 4th. Just a little true…. Do I feel it necessary to put up the sign below in my yard? No. I am not bothered by all fireworks. 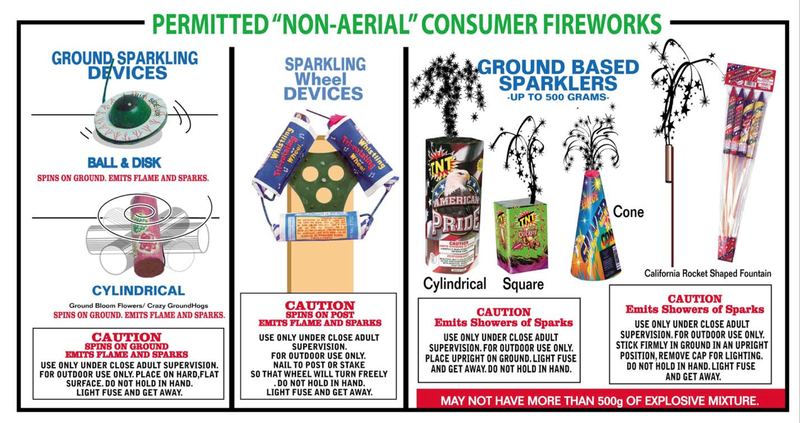 My neighbors’ ground displays were beautiful to witness, but the report (see illegal fireworks below) was upsetting. In fact, last year, when my husband and I watched one of the larger fireworks display from our vantage point of Studio Movie Grill in Scottsdale. We had gone to see Maleficent, the movie ended just in time for us to be greeted by a fireworks display outside the theater, and we caught sight of several fireworks displays on our drive back to Mesa. Distance helps keep this practice enjoyable for me. We even lit off some of the non permissible fireworks (shown below) when we visited family in Wyoming. But we controlled our environment to make the experience enjoyable. 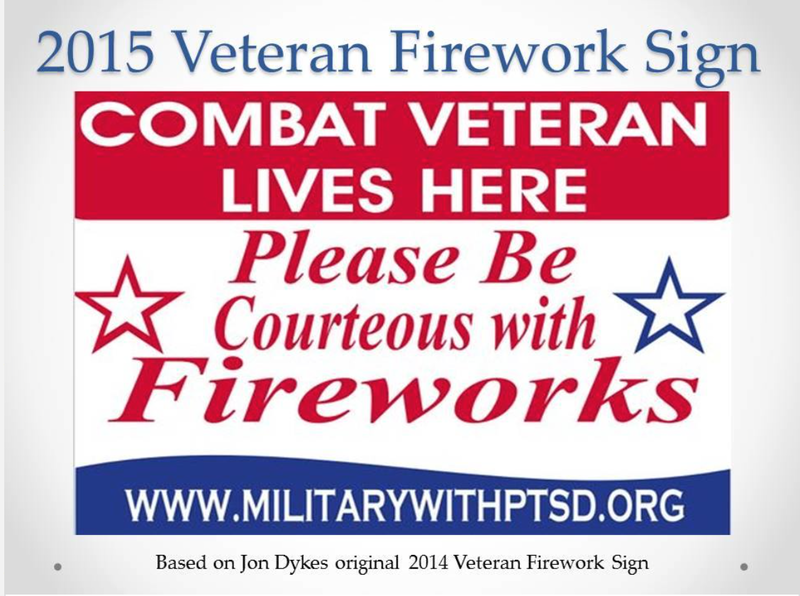 Some veterans put this sign up in their yards to remind their neighbors to be respectful in their revelry. I also took the time today to look at what Gilbert’s rules are for fireworks. Turns out my neighbors held some displays not permissible under Gilbert’s laws. 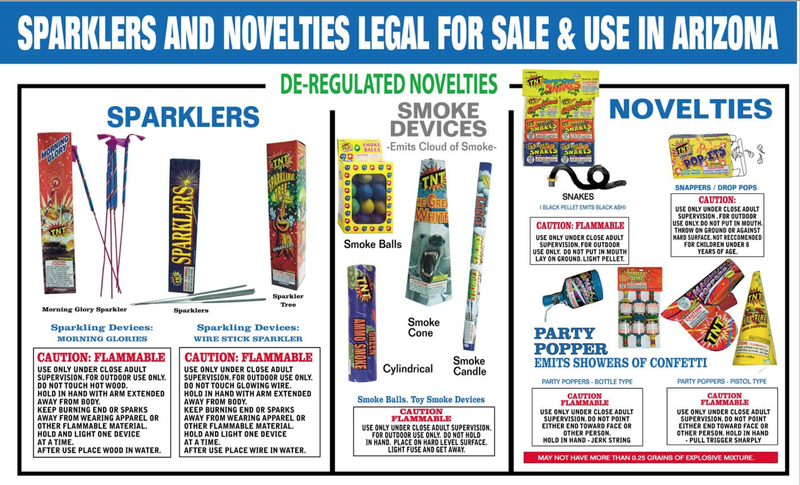 This might be an issue of being ignorant of the law, which certainly is no excuse, but below are the images available showcasing what individuals can light off during permissible dates. Personally, I hope people realize the $1,000 penalty for using illegal fireworks is not worth the risk. Fireworks aren’t permissible again here until Christmas Eve, so I have months to relax again until fireworks become (potentially) an issue again. My daughter is of an age where she wants to watch fireworks, but thankfully is also young enough to not typically stay up late enough to see any displays. We’ll address this issue as she grows up so we find a healthy balance for our family.